Big drops stood on the boatman’s forehead as he struggled desperately with his paddle against the fleeing tarpon that was dragging us swiftly out to sea. In the smoothest water the gunwales of our cranky little canoe stood but five inches above the surface. Twice already, in fighting the big fish, I had nearly capsized the tiny craft and water had poured over its sides until we sat in a pool that reduced to three inches the barrier between us and the Gulf. For we were two miles off the coast, in the Gulf of Mexico, while to the eastward a heavy squall was building, marked by black masses of clouds capped by thunderheads and quite certain to strike us. It was the hurricane month and as the boatman fought with the paddle and I with the rod, neither of us needed to be told that we had no business to be outside of the pass. I had struck the tarpon an hour before in Charlotte Harbor and after a number of brilliant preliminary leaps and a few quick runs in several directions that had threatened alike my equilibrium and my rod, he had dashed for the open Gulf through Big Gasparilla Pass. 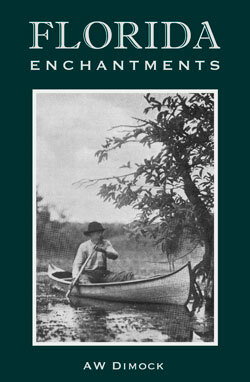 In the swift current of the ebbing tide he had his own way with us, although I gave my tarpon line a chance to make good its warranted strength of forty pounds and braced against my shoulder the heavy rod until it cracked, while my boatman paddled mightily for the shore. But the silver king swam swiftly and strongly with occasional joyous leaps, helped on by wind and tide, and always seaward, while the shore receded with every minute that passed. The Camera-man made the painter of the canoe fast to his skiff, took my paddle and with the two boatmen labored lustily with paddles and oars. My work with the rod was scarcely less strenuous. I put upon the tackle all the strain it would bear, but from time to time lost line to the tarpon until nearly six hundred feet were out and not many turns left on the reel. Then came sudden relief as the fish dashed toward us, followed by the fear that he had broken loose. For I reeled in many yards feeling only the strain of the dragging line until I had half its length to the good, and was counting the game as lost when, within fifty feet of the canoe, the tarpon rose half a dozen feet in the air while a great splash in his wake told of his narrow escape from a tiger of the sea. His pursuer disappeared and I reeled in line until I again felt the pull of the fish which was now ahead of us and making for the shore, when there appeared, swimming silently beside the canoe, so near that I could have laid my hand upon him, quite the largest hammerhead shark I have ever had the fortune to meet. His length of over fifteen feet exceeded that of our craft, which seemed frail indeed beside the monster, and a glassy eye at the end of the three-foot bar across the brute’s nose looked us coldly over. His back rose above the surface, his leg-o-mutton dorsal fin loomed beside us, the boatman stopped paddling and I held my breath as I thought how a single stroke of that powerful tail, followed by a few judicious bites, would dispose of canoe and contents, leaving no trace of either, excepting that the weight of a wandering tiger of the sea would have been increased about one-fifth. He swam higher than any shark I had ever seen and I held my rod idly with loosened reel waiting for the verdict, for it was plain that the big brute had it in mind to attack us, recalled with a shudder my scornful statements that sharks in these waters never attack human beings and wondered how my boatman felt about his airy offers to run any shark in the Gulf out of the country with a stick. It was sport royal and without misadventure until having paddled safely through the breakers, I was caught in the trough of the sea while trying to turn the canoe, rolled over, smothered in foam and, after an exciting swim for the shore through turbulent water towing a wave-tossed canoe, was sent sprawling up on the beach with canoe and paddle tumbling about my body. The plate-holder of the Camera-man chanced to be empty at the instant of the incident and he lamented his misfortune loudly in ill-concealed hope that I would try it again. When the gale abated we sailed south to Boca Grande, the big pass, headquarters of the marine monsters of the coast. The channel here is ten fathoms deep, the pass a mile wide, the tide swift and the rough water abounds in possibilities and big fish. There were sharks that chased and killed our tarpon as I played them. When the sea was so rough that the crests of the waves spilled water over the low sides of the canoe, these brutes became most active and followed their prey and mine so fiercely as to threaten the destruction of our craft by collisions, often narrowly averted. Sometimes we saw beside our canoe the big, open, three-foot mouth of a devil-fish, sixteen feet across the back, with hornlike flippers on each side of his head-as harmless in his nature as he is devilish in appearance. Yet a playful touch of his great wings lifted half out of water and nearly capsized the skiff of the Camera-man who was following him too closely. “What’s that?” exclaimed the boy who was rowing the skiff. “Hell! ! !” said the boy. One morning a thousand-pound manatee rose beside the canoe, looked in my face and failing to recognize an old friend, dove hastily, sending, with a stroke of his thick tail, as is the custom of the creature when frightened, a column of water high in air. Dolphins rolled their backs above water where fish abounded, heads of great turtles, uplifted for air, dotted the surface and often rising beside the canoe disappeared suddenly with a gasp of surprise. Sluggish jewfish sometimes took our bait. If they chanced to be very small, we had jewfish chowder for supper, otherwise we let the big, ugly things go. We wasted no time on the horse-mackerel. Whenever a shark got on our hook we devoted hours, if necessary, to his extinction, although this compelled us to land on the beach to finish the brute. A prudent man doesn’t pull a frail canoe beside a fighting-mad tiger of the sea. We slaughtered sharks because they killed other fish, and spared tarpon because, in the big pass tarpon can best be caught from near the bottom of the channel and should be fished for with fifty feet of line and a heavy sinker. 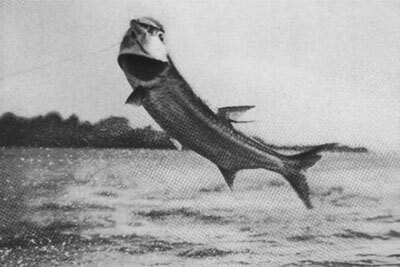 In shallow water the tarpon leaps high in air the instant he feels the hook, but in the pass he often fights for a minute or two before coming to the surface. More than once when I had come to fear that my tarpon was a shark, he has suddenly shot above the surface, like a bullet from ‘a gun and in the first wild shake of his head thrown hook and bait fifty feet in the air, and one even sent a four-ounce leaden sinker flying over my head from nearly twice that distance. Other tarpon when struck came straight up from the bottom, one grazing our gunwale as he rose and another leaping over the stern of the canoe. As soon as a tarpon was tired enough to let us pull the canoe beside him we removed the hook from his mouth and let him swim home to his family. 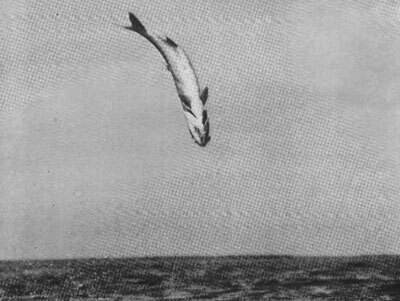 It happened once that a tarpon was less tired than we had assumed. On that occasion we swam home and he had a good man-story to tell his friends that evening. 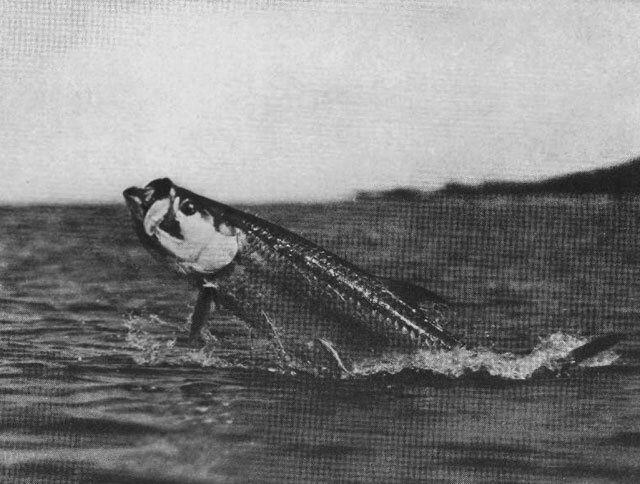 It had been counted a poor year for tarpon, yet in fifteen consecutive days of fishing we were fast to forty-four tarpon, each of which had jumped for us from one to twelve times. This high-water mark of twelve jumps was made by a tarpon which was stimulated to his later efforts by the presence of a pursuing shark and the twelfth jump was a double number. There was commotion in the crimsoned water, new vigor at the other end of my line, and it was an hour later when I finally landed on a sandbar a shark with an aldermanic stomach. A knife drawn across this distended organ disclosed the tarpon in sections with the hook still fast in his jaw and enabled the Camera•man to photograph together the subjects he had recently photographed separately. Although this shark was only one-fifth the size of our big hammerhead, yet he made but two bites of his victim. Our work at Boca Grande ended with the red letter day of the season, of all seasons. I was fishing in the pass with fifty feet of line and the bait was directly under the canoe when a tarpon struck fiercely, quickly carried away a hundred more feet of line and then swam so swiftly toward us that I feared, from the loosened line, that he had escaped, when, fifty feet from the canoe, there shot into the air a giant tarpon, measuring, as we learned afterward, an even seven feet. Up! up! up! he rose, until the camera seemed to be pointed at the zenith and before the rattled Camera-man could get his aim the silver king had turned gracefully in the air and was plunging downward. The captain swears that he saw, swinging clear of the water, the ribbon which marked twenty-five feet on the line as it hung plumb down from the tarpon in the air.